Metrics are updated every five minutes and automatically collected and pushed to CloudWatch for every EMR cluster. This interval is not configurable. There is no charge for the Amazon EMR metrics reported in CloudWatch. Metrics are archived for two weeks, after which the data is discarded. How Do I Use Amazon EMR Metrics? The metrics reported by Amazon EMR provide information that you can analyze in different ways. The table below shows some common uses for the metrics. These are suggestions to get you started, not a comprehensive list. 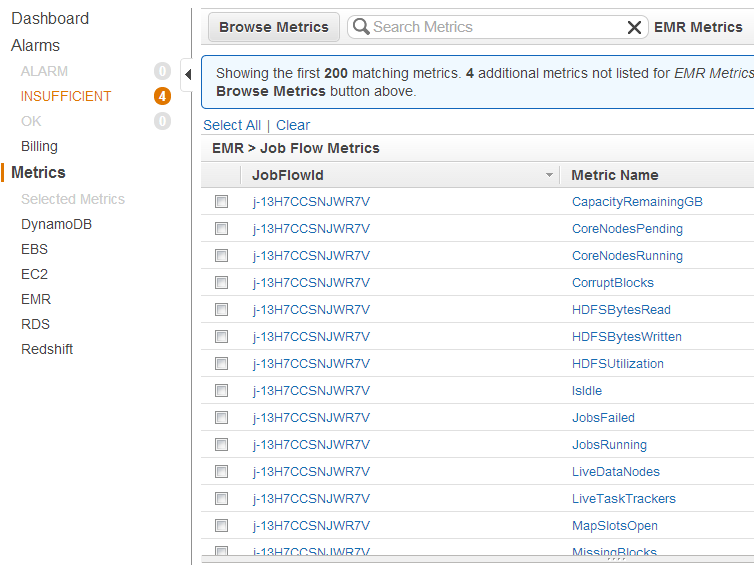 For the complete list of metrics reported by Amazon EMR, see Metrics Reported by Amazon EMR in CloudWatch. Track the progress of my cluster Look at the RunningMapTasks, RemainingMapTasks, RunningReduceTasks, and RemainingReduceTasks metrics. Detect clusters that are idle The IsIdle metric tracks whether a cluster is live, but not currently running tasks. You can set an alarm to fire when the cluster has been idle for a given period of time, such as thirty minutes. Detect when a node runs out of storage The HDFSUtilization metric is the percentage of disk space currently used. If this rises above an acceptable level for your application, such as 80% of capacity used, you may need to resize your cluster and add more core nodes. There are many ways to access the metrics that Amazon EMR pushes to CloudWatch. You can view them through either the Amazon EMR console or CloudWatch console, or you can retrieve them using the CloudWatch CLI or the CloudWatch API. The following procedures show you how to access the metrics using these various tools. To view metrics for a cluster, select a cluster to display the Summary pane. Choose Monitoring to view information about that cluster. Choose any one of the tabs named Cluster Status, Map/Reduce, Node Status, IO, or HBase to load the reports about the progress and health of the cluster. After you choose a metric to view, you can select a graph size. Edit Start and End fields to filter the metrics to a specific time frame. In the navigation pane, choose EMR. Scroll down to the metric to graph. You can search on the cluster identifier of the cluster to monitor. Open a metric to display the graph. Call mon-get-stats. For more information, see the Amazon CloudWatch User Guide. Call GetMetricStatistics. For more information, see Amazon CloudWatch API Reference. Amazon EMR pushes metrics to CloudWatch, which means you can use CloudWatch to set alarms on your Amazon EMR metrics. You can, for example, configure an alarm in CloudWatch to send you an email any time the HDFS utilization rises above 80%. The following topics give you a high-level overview of how to set alarms using CloudWatch. For detailed instructions, see Create or Edit a CloudWatch Alarm in the Amazon CloudWatch User Guide. Choose Create Alarm. This launches the Create Alarm Wizard. Choose EMR Metrics and scroll through the Amazon EMR metrics to locate the metric you want to place an alarm on. An easy way to display just the Amazon EMR metrics in this dialog box is to search on the cluster identifier of your cluster. Select the metric to create an alarm on and choose Next. Fill in the Name, Description, Threshold, and Time values for the metric. If you want CloudWatch to send you an email when the alarm state is reached, in the Whenever this alarm: field, choose State is ALARM. For Send notification to:, select an existing SNS topic. If you choose Create topic, you can set the name and email addresses for a new email subscription list. This list is saved and appears in the field for future alarms. If you use Create topic to create a new Amazon SNS topic, the email addresses must be verified before they receive notifications. Emails are only sent when the alarm enters an alarm state. If this alarm state change happens before the email addresses are verified, they do not receive a notification. At this point, the Define Alarm screen gives you a chance to review the alarm that you’re about to create. Choose Create Alarm. For more information about how to set alarms using the CloudWatch console, see Create an Alarm that Sends Email in the Amazon CloudWatch User Guide. Call mon-put-metric-alarm. For more information, see Amazon CloudWatch User Guide. The following tables list the metrics that Amazon EMR reports in the console and pushes to CloudWatch. 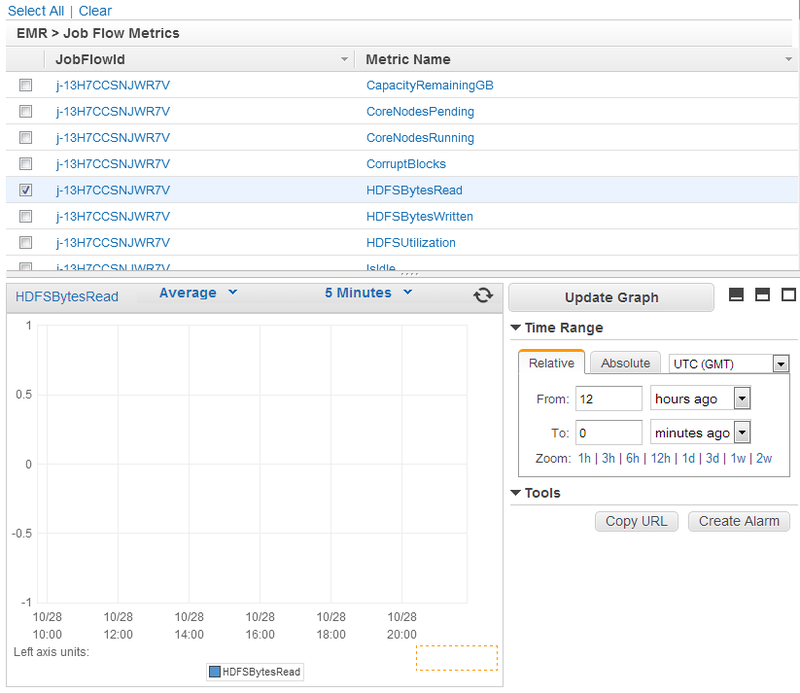 Amazon EMR sends data for several metrics to CloudWatch. All Amazon EMR clusters automatically send metrics in five-minute intervals. Metrics are archived for two weeks; after that period, the data is discarded. The AWS/ElasticMapReduce namespace includes the following metrics. Amazon EMR pulls metrics from a cluster. If a cluster becomes unreachable, no metrics are reported until the cluster becomes available again. The following metrics are available for clusters running Hadoop 2.x versions. Indicates that a cluster is no longer performing work, but is still alive and accruing charges. It is set to 1 if no tasks are running and no jobs are running, and set to 0 otherwise. This value is checked at five-minute intervals and a value of 1 indicates only that the cluster was idle when checked, not that it was idle for the entire five minutes. To avoid false positives, you should raise an alarm when this value has been 1 for more than one consecutive 5-minute check. For example, you might raise an alarm on this value if it has been 1 for thirty minutes or longer. The number of resource containers allocated by the ResourceManager. The number of containers reserved. The number of containers in the queue that have not yet been allocated. The ratio of pending containers to containers allocated (ContainerPendingRatio = ContainerPending / ContainerAllocated). If ContainerAllocated = 0, then ContainerPendingRatio = ContainerPending. The value of ContainerPendingRatio represents a number, not a percentage. This value is useful for scaling cluster resources based on container allocation behavior. The number of applications submitted to YARN that have completed. The number of applications submitted to YARN that have failed to complete. The number of applications submitted to YARN that have been killed. The number of applications submitted to YARN that are in a pending state. The number of applications submitted to YARN that are running. The number of applications submitted to YARN. The number of core nodes working. Data points for this metric are reported only when a corresponding instance group exists. The number of core nodes waiting to be assigned. All of the core nodes requested may not be immediately available; this metric reports the pending requests. Data points for this metric are reported only when a corresponding instance group exists. The percentage of data nodes that are receiving work from Hadoop. The number of nodes presently available to MapReduce jobs. Equivalent to YARN metric mapred.resourcemanager.TotalNodes. The number of nodes presently running MapReduce tasks or jobs. Equivalent to YARN metric mapred.resourcemanager.NoOfActiveNodes. The number of nodes allocated to MapReduce that have been marked in a LOST state. Equivalent to YARN metric mapred.resourcemanager.NoOfLostNodes. The number of nodes available to MapReduce jobs marked in an UNHEALTHY state. Equivalent to YARN metric mapred.resourcemanager.NoOfUnhealthyNodes. The number of nodes allocated to MapReduce applications that have been marked in a DECOMMISSIONED state. Equivalent to YARN metric mapred.resourcemanager.NoOfDecommissionedNodes. The number of nodes available to MapReduce that have been rebooted and marked in a REBOOTED state. Equivalent to YARN metric mapred.resourcemanager.NoOfRebootedNodes. The number of bytes written to Amazon S3. The number of bytes read from Amazon S3. The percentage of HDFS storage currently used. The number of bytes read from HDFS. This metric aggregates MapReduce jobs only, and does not apply for other workloads on EMR. The number of bytes written to HDFS. This metric aggregates MapReduce jobs only, and does not apply for other workloads on EMR. The number of blocks in which HDFS has no replicas. These might be corrupt blocks. The number of blocks that HDFS reports as corrupted. The total number of concurrent data transfers. The total amount of memory in the cluster. The amount of memory reserved. The amount of memory available to be allocated. The percentage of remaining memory available to YARN (YARNMemoryAvailablePercentage = MemoryAvailableMB / MemoryTotalMB). This value is useful for scaling cluster resources based on YARN memory usage. The amount of memory allocated to the cluster. The number of blocks marked for deletion. The number of blocks that need to be replicated one or more times. The status of block replication: blocks being replicated, age of replication requests, and unsuccessful replication requests. The amount of remaining HDFS disk capacity. Whether the last backup failed. This is set to 0 by default and updated to 1 if the previous backup attempt failed. This metric is only reported for HBase clusters. The amount of time it took the previous backup to complete. This metric is set regardless of whether the last completed backup succeeded or failed. While the backup is ongoing, this metric returns the number of minutes after the backup started. This metric is only reported for HBase clusters. The number of elapsed minutes after the last successful HBase backup started on your cluster. This metric is only reported for HBase clusters. The number of jobs in the cluster that are currently running. The number of jobs in the cluster that have failed. The number of running map tasks for each job. If you have a scheduler installed and multiple jobs running, multiple graphs are generated. The number of remaining map tasks for each job. If you have a scheduler installed and multiple jobs running, multiple graphs are generated. A remaining map task is one that is not in any of the following states: Running, Killed, or Completed. The unused map task capacity. This is calculated as the maximum number of map tasks for a given cluster, less the total number of map tasks currently running in that cluster. The ratio of the total map tasks remaining to the total map slots available in the cluster. The number of running reduce tasks for each job. If you have a scheduler installed and multiple jobs running, multiple graphs are generated. The number of remaining reduce tasks for each job. If you have a scheduler installed and multiple jobs running, multiple graphs are generated. Unused reduce task capacity. This is calculated as the maximum reduce task capacity for a given cluster, less the number of reduce tasks currently running in that cluster. The number of task nodes working. Data points for this metric are reported only when a corresponding instance group exists. The number of task nodes waiting to be assigned. All of the task nodes requested may not be immediately available; this metric reports the pending requests. Data points for this metric are reported only when a corresponding instance group exists. The percentage of task trackers that are functional. The number of bytes written to Amazon S3. This metric aggregates MapReduce jobs only, and does not apply for other workloads on EMR. The number of bytes read from Amazon S3. This metric aggregates MapReduce jobs only, and does not apply for other workloads on EMR. The number of bytes read from HDFS. The number of bytes written to HDFS. The current, total number of readers and writers reported by all DataNodes in a cluster. Use case: Diagnose the degree to which high I/O might be contributing to poor job execution performance. Worker nodes running the DataNode daemon must also perform map and reduce tasks. Persistently high TotalLoad values over time can indicate that high I/O might be a contributing factor to poor performance. Occasional spikes in this value are typical and do not usually indicate a problem. Amazon EMR data can be filtered using any of the dimensions in the following table. JobFlowId The same as cluster ID, which is the unique identifier of a cluster in the form j-XXXXXXXXXXXXX. Find this value by clicking on the cluster in the Amazon EMR console. JobId The identifier of a job within a cluster. You can use this to filter the metrics returned from a cluster down to those that apply to a single job within the cluster. JobId takes the form job_XXXXXXXXXXXX_XXXX.